By R.L. Stine & German Peralta, et al. So, Man-Thing talks now? The f--- did that happen? Of all the new titles Marvel's letting off the chain this month, Man-Thing is the one I've been most looking forward to. The original series from the seventies is probably the first bonafide horror comic of which I could ever call myself a fan (though I didn't start reading it until long after the first and second Man-Thing series had closed their respective doors). I've never read anything by R.L. Stine, though I figured he's sold more books than I so trusting him with Marvel's favorite plant monster might be a fine idea. In fact, I was so convinced it was a smart purchase that rather than ask my local comics seller to just hold the first issue for me so I could decide whether or not I'd add it to my regular pull list, I bypassed the screening process entirely and had him go ahead and throw it on my list of monthly reads; affording the new Man-Thing a privilege I usually reserve only for the kind of proven creative teams that just never miss, or - alternatively - anything with the Hulk in it. Kind of regretting that now. The issue opens on what appears to be a battle between Man-Thing and some kind of giant bug monster thing. 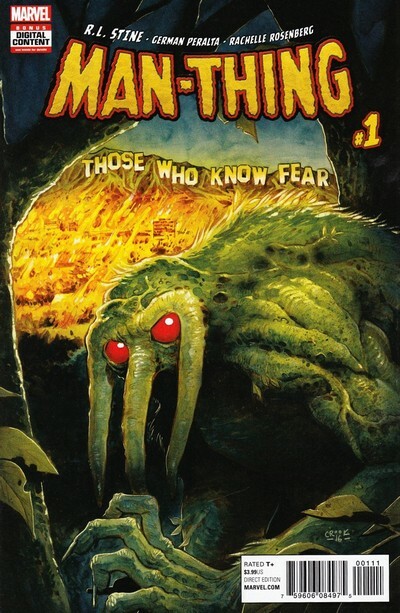 Soon, we learn Man-Thing is in a movie studio and the giant bug monster thing is just a dude in a suit. While being urged to stay as far from his office furniture as possible, Man-Thing is fired by a heartless studio executive who is disappointed with Man-Thing's test screenings and the nausea the swamp monster inspired. Wandering the streets of Hollywood and bemoaning his luck, Man-Thing is attacked by what appears to be the older, mindless version of himself. There is something deadening to the narrative tone of Man-Thing, like it doesn't know what it wants to be. Once you learn the monster is an aspiring actor on a movie set, you think it's going to be something in the vein of the Chip Zdarsky/Joe Quinones Howard the Duck series, but it doesn't seem to know it's own place in its own absurdity. Man-Thing is unsure about whether or not it's supposed to take itself seriously. It's got a Sliver Age sense of humor that's poking fun at the Silver Age, but not ironically. When Man-Thing says to his mindless doppelganger, "You want to dance? How about if I lead!" and then punches him, you aren't actually sure whether or not Stine thinks, "How about if I lead," is funny. Like, does he think that's oh-let's-lampoon-the-corny-old-comics-dialogue funny? Or is he actually thinking it's funny ha-ha, like I will make a noise while reading this that is largely involuntary and signifies being entertained? I don't know. I don't know which. Not a fan just yet. I don't know if this will be standard for the rest of the mini, but this issue also ends with the 4-page Stine-written back-up story "Put A Ring On It." The story features wonderful art by Daniel Johnson and Mat Lopes, but the story itself feels like an afterthought, and its surprise ending will tear a horrified "meh" from your quivering bowels. So Stine & co. get one more issue to prove to me I'm stupid. Otherwise, I'm flushing this series and picking up a copy of one of the Steve Gerber collections instead.